Ever evolving are the techniques and tools that talented medical professionals use when treating patients – and that now includes a radiation-free procedure that can correct irregular heartbeats. Now that Donna Stout’s arrhythmia is corrected, she notices increased energy levels. 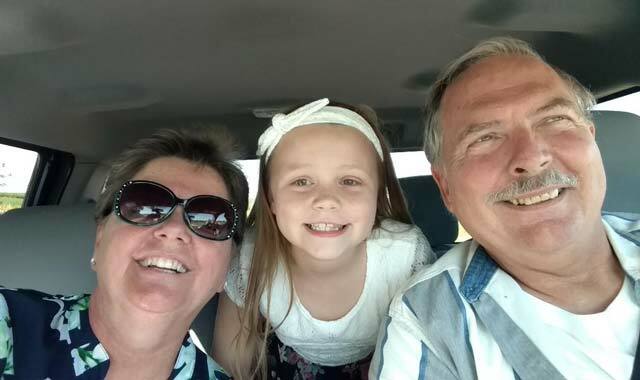 One of her favorite activities is camping with her husband, Don, and granddaughter Jasmine. When Donna Stout’s heart began to “race out of control,” she assumed it was due to anxiety. She always feels particularly anxious when riding in a car, and, at age 59, she figured she was too young to be having heart complications. Stout was sent home with a special device to monitor her heart and, within a couple of hours, received a call to head immediately to the hospital. Three days later, her heart “acted up” again. Then a third time the following morning. Finally, Stout admitted she needed to return to the emergency room. “I admit, I’m not always the best patient, but I was scared and went into the hospital after it started beating out of control a third time,” she says. Stout stayed in the hospital for three days while doctors monitored her heart and learned she had atrial fibrillation (AFib) that was causing blood to coagulate inside her heart. According to the American Heart Association, at least 2.7 million Americans are living with AFib, which means they have a quivering or irregular heartbeat (arrhythmia). If left untreated, AFib can lead to blood clots, stroke, heart failure and other heart-related complications. Stout was discharged from the hospital and placed on medications. At her 30-day checkup, she was referred to Dr. Mansour Razminia, the director of cardiac electrophysiology at Presence Saint Joseph Hospital, in Elgin. Razminia is an expert at correcting cardiac arrhythmias by doing catheter ablation procedures. Stout recalls her first meeting with Razminia. He talked her through the procedure and even drew a heart to help her visualize each step. Within two weeks of meeting Razminia, Stout underwent her catheter ablation procedure on Aug. 30, 2017. Besides two small holes in her groin area, which healed within a couple of days, Stout felt no side effects after the procedure. And, her heart rhythm has been normal ever since. According to Razminia, catheter ablations have been done for more than 30 years. Historically, physicians would need to use X-rays to see the catheter inside the heart. Since the procedure could last several hours, that meant patients potentially had up to a few hours of radiation exposure. Razminia says 20 minutes of radiation is comparable to having more than 160 chest X-rays. “That increases the risk of cancer,” he adds. “With about 60 minutes of radiation, you may have one additional chance in every 300 people of getting cancer. And unfortunately, that risk remains with that patient for the rest of their life. Following his desire for a better way to conduct catheter ablations, Razminia has become the first person in the nation to perform every one of his catheter ablation procedures without using radiation. He started doing radiation-free catheter ablations in 2010 and has now performed these procedures on more than 1,500 consecutive patients. He even travels to universities and hospitals throughout the world to give presentations to other physicians. Razminia uses the EnSite (ESI) system, a catheter navigation and mapping system, as well as intracardiac ultrasound to conduct radiation-free catheter ablations. He takes catheters that have platinum on the tip and inserts them through the groin to reach the heart. From there, he can freeze or burn (ablate) the area where there is a rhythm abnormality. When Stout discovered her procedure would be radiation-free, she was all in on correcting her arrhythmia. The successful procedure has greatly impacted Stout’s life. She’s become much more active since her arrhythmia was corrected. She enjoys camping, sightseeing and strolling through outdoor markets with her husband, Don. She adds that anyone hesitant about the procedure should speak to Razminia directly. This entry was posted on Tuesday, January 9th, 2018 at 11:59 am	and is filed under Health & Fitness. You can follow any responses to this entry through the RSS 2.0 feed. Both comments and pings are currently closed.